Nowadays, differentiation and success on the market are not achieved by features, but by a unique customer experience, new services and connections between products and services. 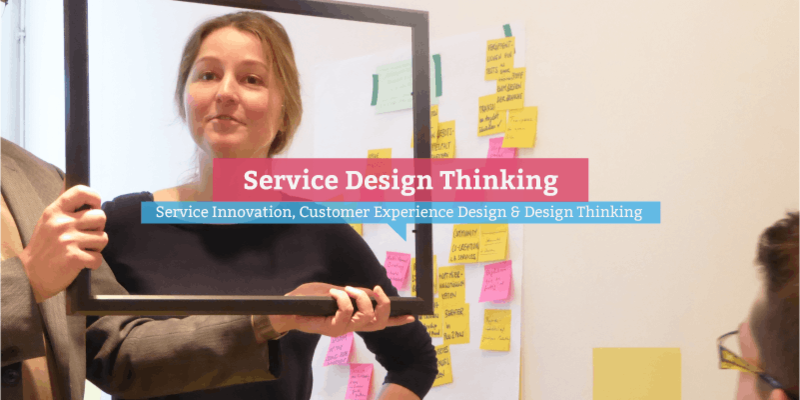 With special processes and methods, service design thinking helps you to identify innovation potential and to create attractive and useful services for your customers, which can be implemented efficiently by you as the provider. This seminar enables you to see the innovation and optimization potential in your own offers, so you can successfully design services and holistic customer experience. When people are using a product or a service, they come in touch with various interfaces and communication channels. The design of such “touchpoints” often lays in the hands of several different teams, which not rarely leads to gaps and breaches in the customer experience. The demand for specially skilled designers, managers and consultants, who can orchestrate a consistent and successful customer experience, is increasing in the private as well as in the public sector. You will get to know methods and tools from human centered design, which will help you to understand your customers better and perceive pain points and improvement potential from their point of view. From there, you learn to come to adaptable and innovative solutions which can be communicated and implemented effectively. The perspective of service design thinking will help you to see your own offers in an integrated way and recognize new opportunities for service expansion or enhancement in all phases, from acquisition to follow-up. The seminar was developed for people who are responsible for the conceptual and strategic development of new services and a holistic, cross-channel customer experience in organizations, agencies, institutions or NGO’s. These are for example, service planners and managers, project and product managers, marketing and sales managers, customer service managers, designers and design managers from all fields (user experience, visual design, product design) as well as architects, scrum masters, product owners, business consultants and start-ups.